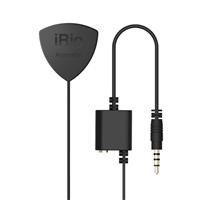 iRig Acoustic is a revolutionary new microphone solution that easily connects your acoustic guitar to an iPhone, iPad, Android device or Mac with stunningly professional sound quality. The size of a large plectrum, iRig Acoustic easily clips inside the sound hole of any acoustic guitar, yet delivers sound quality that rivals complex, expensive recording setups for a fraction of the price. iRig Acoustic captures the full range and timbre of your instrument in the most life-like manner. Unlike magnetic or piezo solutions, iRig Acoustic doesn't color the sound of your instrument, and offers extended frequency response and low-noise circuitry throughout. The output of iRig Acoustic connects directly to your iPhone, iPad, Android device, or Mac, and offers a 1/8 headphone output for monitoring.